ELV note: It was just announced this week that the executive chef of Momofuku Las Vegas (Michael Chen) left after only two months on the job. We doubt this will affect any of the food there, however, as the “executive chefs” in most celeb chef Strip restaurants are little more than functionaries, executing a menu that is pre-determined thousands of miles away. Our objections to the food (as you will read below) has much more to do the recipes as conceptualized, not as they were cooked. ELV Note #2: The following review appears in this month’s issue of Desert Companion magazine. It’s hard not to admire what Chef David Chang has done with Momofuku (“Lucky Peach” in Korean). What began as an eight-seat eatery in lower Manhattan in 2004 has spawned an empire that now stretches from Soho, New York to Sydney Australia. It’s also not hard, after eating your way through Momofuku, to sometimes wonder what all the shouting is about – shouting from the rooftops being what the influential New York food media has done almost from the day Chang opened. Once they laid the groundwork, social media took over, and for well over a decade, foodies the world over have been inundated with tales of Chang’s influence and ground-breaking cuisine. When other chefs and restaurants went into recession hibernation in 2008, Chang kicked his expansion into high gear, opening noodle bars, Vietnamese restaurants and impossible-to-get-into joints in New York — expanding his brand while taking full advantage of the rise of the Millennials and their need to have something tasty (and Instagram-worthy) to eat. There are now five Momofukus in the world, more are planned, and to the delight of his fans, Las Vegas finally has one. In the beginning, the entire Chang oeuvre consisted of barely a handful of items. Because of its small size, the original Momofuku Noodle Bar in lower Manhattan featured a few bowls of ramen, a couple of appetizers and some stuffed bao buns and that was it. On such bare bones was a food empire born. The genius of Chang did was in upgrading those noodles, enriching the broth, and loading smoky bacon onto classic Korean and Japanese items that, until he came along, most Americans wouldn’t touch with a ten food chopstick. He also cooked (and seasoned) the Korean fried chicken like a real chef, and made a big deal about using better ingredients. No bottom bin ham for him. He used real Virginia country ham, Kurobuta pork, and the fluffiest bao he could find. He cured his own pickles too, (a big deal in 2004) and made sure everyone in the food media knew about it. Most of all, though, Momofuku became all about umami — umami being the word for the intense, savory quality that only the densest, saltiest, most amino-acid rich foods (like steak, cheese, smoked meats and soy sauce) possess. In the Chang universe (then and now), it’s all about overwhelming your palate with this fifth taste (after sweet, sour, salty, and bitter). His food does this at the expense of delicacy and refinement but his audience didn’t seem to care one bit. Subtlety being as important to a David Chang meal as dialogue is in a Vin Diesel movie. Thus will most of your meal be so umami-drenched that your palate will be screaming for mercy after several plates appear, each overloaded with whatever miso-shoyu-smoky-kombu concoction Chang can’t help buy incorporating into every bite. If smoke is your thing, you’ll be in smoked hog heaven. By all means then, don’t miss the pork meatballs swimming in (you guessed it) plenty of smoked black-eyed peas. Is Momofuku’s pork ramen soup good? Yes, but it’s also so smoky that three sips in you will want to run up the white flag. Ditto the oysters Momofuku – the seafood essence of which is obliterated by smoky bacon bits. There’s also a smoked pork chop and roasted mussels on the menu, with the mussels being festooned with (wait for it) plenty of smoked Benton’s bacon. The food is so smoky here it ought to be sponsored by Marlboro. When Chang and his troops are through pouring on the smoke, they find many other ways to up the umami ante. Sichuan rice cakes are thick stubby rice noodles smothered with pork sausage, while chilled spicy noodles get a heap of sausages and cashews to effectively overwhelm the interesting starches and spices beneath them – pork sausage and cashews being the belt and suspenders of the umami-overload universe. After three trips around this menu, I threw in the towel. There are some good things to eat here – the spicy cod hotpot being good fish, well-treated; the katsu chicken an old-fashioned, mushroom cream sauce delight – but by the time you get to them, you will have been drowned by a tsunami of umami. By all means get the pork belly buns (the ones that made Chang famous), but skip the chicken karaage version – they being sad and stringy. The vaunted rotisserie chicken comes with deep-fried bones (some edible, some not), and is not as good as it thinks it is. What is good is the seating. 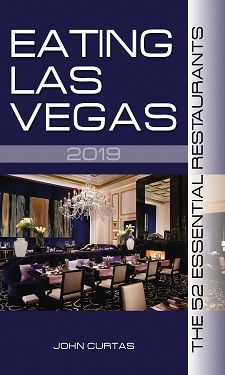 You may have trouble getting one, but that’s only because every under-40 in Vegas seems to be beating a path to this second floor location in The Cosmopolitan these days. What they find is a large restaurant fronted by a long bar that itself is five times the length of the original operation. Beside that bar are a number of high tops – for waiting, drinking or overflow dining – and beyond them a huge open kitchen that looks like it could feed an army base. For its size, the room is remarkably comfortable, the tables well-spaced, and the noise level (relatively) civilized. Service is also top notch, with management and waiters who are well-versed in the food. The wine list is sinfully overpriced, and the sake/sochu list woefully sparse. David Chang deserves a lot of credit. He made this food safe for aspirational foodies and non-Asians alike — folks with limited resources who wanted to hop on the foodie bandwagon and expand their knowledge of chewy noodles, miso broth and various edible esoterica. All of this was a treat when you were ducking into a teeny tiny noodle emporium for a quick fix of soup and a bao bun. To put an entire meal together from this food, however – after your taste buds have been bludgeoned into one-dimensional submission – is a big-box experience of a different order. If you still use party as a verb, and don’t mind that everything on your table tastes the same, you might feel right at home amongst all the umami. Nothing about Momofuku is as good as its reputation, but in this day and age, that’s enough.